There are steps leading down from the car park to the castle, but visitors with limited mobility may drive down to the square in front of the castle (which is otherwise reserved for residents). The rooms in the castle can only be reached via steps. 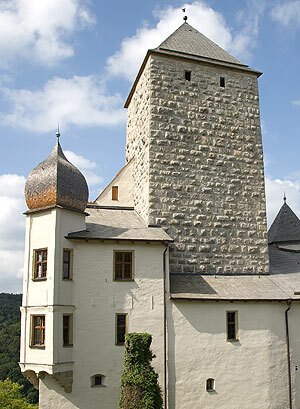 The Castle Courtyard (Burghof) is accessible for wheelchairs. There is a barrier-free disabled toilet in the administrative building next to the castle. Taking pictures or filming is not allowed during the guided tours. Pictures of the outside of the castle may be taken for private use only. Photo and film shootings for further use as well as the flying of drones / multicopters are basically subject to approval and charges. Here you will find information on photography permits / film permits. Bulky items may not be taken into the museum rooms. Prams and child carriers as well as large bags, rucksacks etc. can be left at the cash desk. No liability can be accepted for items deposited there. Dogs may only be taken into the castle if they are carried. They may be taken on leads into the castle courtyard. No food and drink may be taken into the museum rooms. Please mute your mobile phone during the guided tour.